Bradley Hall produced a storming second round to win the Halifax-Huddersfield Union’s Scratch Team Championship for the third time in four years on Sunday. But their trio of Sam Bridges, Elliott Lister and Andy Hare cut it fine at sunny West End, winning on a better back 18 after both they and Meltham had totalled 429. Hall were fourth behind hosts West End, Meltham and Huddersfield after 18 holes of the Glenbrae-sponsored event. However, Lister improved dramatically on his morning 78 with the round of the day, a 68. Bridges backed up his earlier 70 with a fine 68 and Hare produced two solid rounds of 72 and 74. Bridges and Hare had been in last year’s winning team at Crosland Heath, when they were joined by Andy Shaw and Chris Lander (now at Huddersfield) in a four-man line-up. Chris Ingham’s first round 70 helped raise West End’s hopes and although they eventually slipped to third, they did have the consolation of picking up the nett team prize. Bridges had the best 36 hole total and Ingham and Lister had the best morning and afternoon rounds respectively. 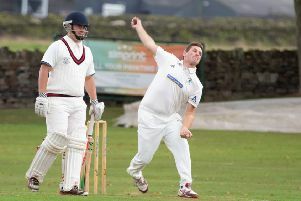 Gross scores: 1 Halifax Bradley Hall 429 220 209 (S Bridges 138 70 68, E J Lister 145 78 67, A P C Hare 146 72 74); 2 Meltham 429 215 214 (T Hunt139 71 68, G. McLean 144 70 74, R Dunleavy146 74 72: 3 West End (Halifax) 436 213 223 (Matthew Godfrey 142 71 71, Chris Ingham 144 70 74, James Dix 150 72 78); 4 Huddersfield 437 216 221 (Richard Broadley 143 71 72, Brad Tupman145 72 73, Chris Lander 149 73 76; 5 Outlane 448 221 227 (Jarrad Hazelden 144 73 71, Steven Beeby 149 75 74, John Lawton 155 73 82; 6 Lightcliffe 451 227 224 (Frazer Schofield 145 76 69, Freddie Stoker 149 77 72, Thomas Williams 157 74 83); 7 Dewsbury District 453 232 221 (Daniel Hartley 148 75 73, Benjamin Crowther151 78 73, Fergus Barron 154 79 75); 8 Todmorden 455 221 234 (David Stafford 150 73 77, Chris Thornsby 150 73 77, Michael Murray 155 75 80); 9 Halifax 456 221 235 (Jamie Smith 145 71 74, Mark Birkett 151 71 80, Greg Hudson-Hunter 160 79 81); 10 Crosland Heath 457 225 232 (L Edmonds 146 72 74, L M Collier 153 76 77, O Shaw158 77 81); 11 Longley Park 457 224 233 (Matthew Colcombe 148 70 78, George Castle 153 78 75, John Doherty 156 76 80); 12 Crow Nest Park 458 229 229 (Nathan Scott 149 73 76, James Edwards 150 73 77, Harry Mowl159 83 76); 13 Hanging Heaton 462 230 232 (S Minto 148 76 72, Matt Glynn 156 76 80, Jacob Scargill 158 78 80); 14 Hebden Bridge 463 230 233 (Iain Powell 149 75 74, George Bamford 152 77 75, Henry Butterworth162 78 84); 15 Bradley Park 467 232 235 (P Kaye 153 76 77, A Taylor 157 78 79, Ben Kaye 157 78 79); 16 Saddleworth 484 235 249 (Dave Pullen 156 74 82, Stephen Pullen 162 80 82, Nick Marner 166 81 85); 17 Elland 488 238 250 (Reece Wilby156 78 78, R Jennison162 76 86, A Bennett170 84 86); 18 Ryburn NR(Lee Clewley 163 82 81, A J Kershaw 77 NR, Robert Emmett DQ). The Halifax-Huddersfield Union’s senior side play East Riding at Hornsea on Sunday in the second match of their Yorkshire Inter-District League campaign. Dave Pullen’s side lost their opener 19-17 against Bradford at Meltham last month, in spite of fine debuts from Will Whiteoak and Callum Hey. The Union’s Handicap Team Championship takes place at Saddleworth on Sunday.